Removes chlorine and chloramine from tap water. 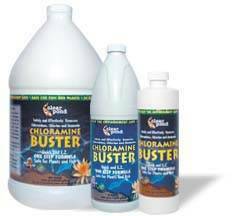 Instantly breaks and quickly eliminates the chlorine/ammonia bond in chloramine. More cities are using chloramine which unlike chlorine does not easily disapate without treatment. Both chlorine and chloramine can be fatal to your fish. Treats 500 gallons per ounce. Available in 16oz, 32oz or gallon. 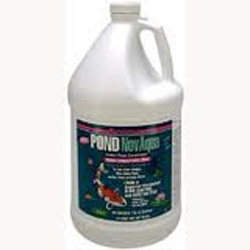 A favorite among serious pond owners. 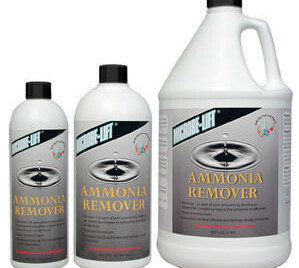 ChlorAm-X dry ammonia remover contains patented molecule that will remove 1 ppm of ammonia with every dose. 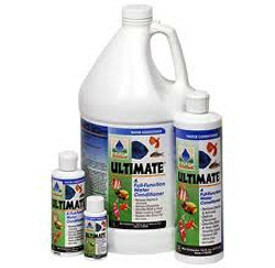 Removes chlorine, destroys chloramines, and eliminates the ammonia that is left behind. Safe for fish and plants. 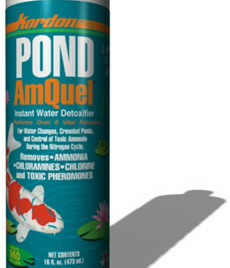 Removes ammonia, chlorine, chloramines and pheromones from water. Non-toxic to aquatic inhabitants or biological filters. An instant, easy-to-use, water detoxifier that performs over six vital functions. Should be used for water changes, crowded aquaria, and control of toxic ammonia during the nitrogen cycle. AmQuel combines with the ammonia molecule to produce a harmless molecule. This product is stable and does not contain formaldehyde. AmQuel does not remove oxygen from water. Significantly increases the fish load that can be safely kept.